At Nova Cold Logistics there is always a chill in the air. It’s been that way for a quarter of a century. 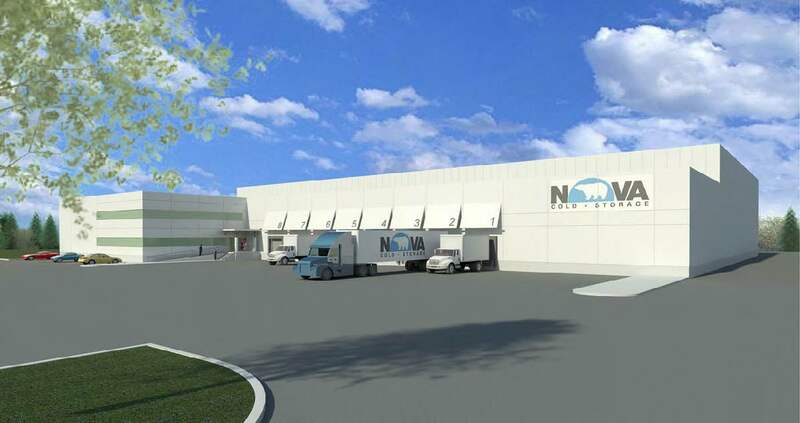 Nova Cold operates approximately 150,000 square feet of cold storage space in three facilities, two of which are located in Burnside Industrial Park and the third in the Halifax Gateway Logistics Park, all in Dartmouth, NS. In 2015, Nova Cold (formerly Brookfield Cold Storage, Calgary) gained a presence in Nova Scotia with the purchase of Nova Cold Storage, adding an Atlantic Canada location to its operations in Central and Western Canada. Approximately 65 to 70 per cent of the product handled by Nova Cold is frozen seafood, says General Manager Mike Harper. The remaining products include dairy, fruit, vegetables and other foods. Located within minutes of Port of Halifax, Nova Cold is a third party logistics provider for both importers and exporters, acting as a hub as containers loaded with product move through the facility, heading to either an international or domestic destination. The temperature controlled containers not only move on truck, but also rail. “We are a bit unique here in that we have our own rail siding at our Thornhill location (Thornhill Drive, Burnside). So we have rail cars for our biggest customers and we are the only one (cold storage facility) to have rail,” he said. Harper said Nova Cold is a fairly large operation. “Our throughput is pretty big. We likely move six million to seven million kilos (of product) a month,” he says. “The great thing about our facility here (Halifax Gateway Park) is we have a temperature controlled dock and our dock at all times is at zero (Celsius) so when you take off boxes there is no temperature change. The dock ramps are inside the building so the doors of the trailer stay closed until the trailer gets into the facility. That is a big thing for our customers,” he said, because it helps to maintain product quality. In the facility’s storage freezers, the temperature is minus 18 Celsius. The Nova Cold spokesman said what is also “unique” about the company “is our excellent service levels. That is what our facilities in the West and Central Canada are known for. We use a HighJump warehouse management system (inventory software). Our customers can track their products in real time, at all times,” he said. “HighJump is an excellent system. They are the 3PL experts of the world,” he said. Harper noted that in the “old days with pen and paper, people actually lost inventory. You don’t want to lose seafood, that’s expensive,” he said. With Nova Cold’s facilities in Nova Scotia at capacity and growth opportunities on the horizon, the company is planning a major expansion, a 60,000-square-foot warehouse attached to its location in Halifax Gateway Logistics Park. The company expects to have the new facility operational by the end of 2018. As for future growth, Harper sees natural growth in the Atlantic Canada seafood industry which already generates over $2 billion for the region’s economy. He also sees increased trade potential with Europe when the Comprehensive Economic and Trade Agreement becomes a reality, and also possibly with China. Nova Cold is a partner in Port of Halifax’s “highly efficient supply chain” and through this supply chain the Port Authority is helping Nova Scotia exporters get their product to international markets, says the Port’s Lane Farguson. “Nova Cold Logistics is an excellent example of a Nova Scotia company that enables producers to access international markets,” said Farguson. “By providing an efficient and convenient way of packing food products and perishable goods to be shipped as frozen or refrigerated cargo, Nova Cold Logistics is helping berry harvesters, seafood producers and the dairy industry to reach customers far beyond the provincial borders of Nova Scotia,” he said. At the Port’s two container terminals operated by Halterm and Ceres, approximately 1,000 electrical plugs for temperature controlled cargo have been installed, and the Port plans to add another 50 plugs this year at Halterm, says Farguson.